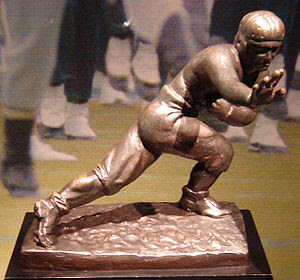 Reliable sources, view link, have confirmed that president Obama is the current favorite to win this year's Heisman Trophy. Apparently the president is known in the sports community for having watched college football. This, along with his universal popularity make it all but certain that the president will be adding yet another trophy to his prestigious collection. I must admit that when I first learned of the news, I was moved to tears. If I may paraphrase the first lady, I've never been so proud of my country.